"O Holy Night" (French: "Minuit Chretiens!" or "Cantique de Noël") is a well-known Christmas carol composed by Adolphe Adam in 1847 to the French poem "Minuit, chrétiens" (Midnight, Christians) written by a wine merchant and poet, Placide Cappeau (1808–1877). 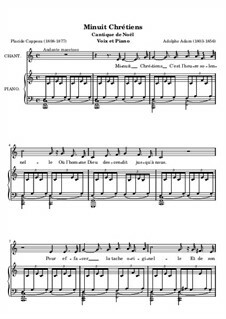 In both the French original and the English version of the carol, as well as many other languages, the text reflects on the birth of Jesus and on humanity's redemption. 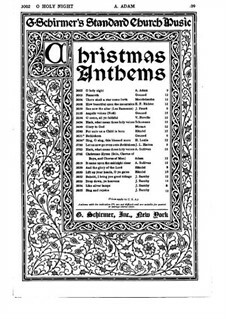 Adolphe-Charles Adams famous Christmas song with English text by John Sullivan Dwight (1813-1893). 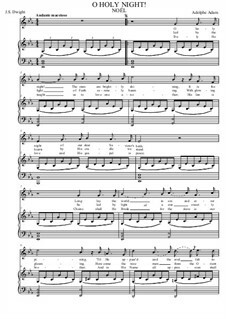 Christmas classic arranged for solo voice, SATB and piano. My all time favourite Christmas carol! A quartet arrangement of this lovely carol. Merry Christmas! 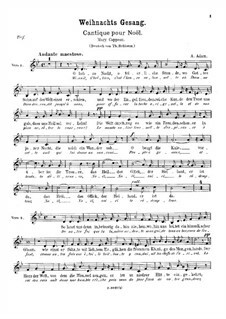 Adolphe-Charles Adam’s famous Christmas Song in an arrangement for SSA choir with guitar quartet or ensemble. This beautiful, sacred Christmas Carol has been arranged for melodic Orff instruments giving the piece an ethereal character. In the key of C Major, students will need their F# and Bb bars for some of the chord changes. Marimba could be substituted for the Bass Xyl. 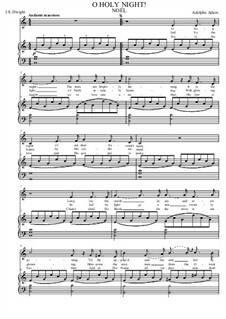 The Alto Met part has mostly broken chord work throughout. 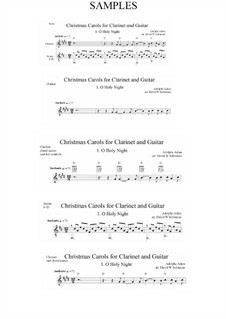 Christmas Carols for clarinet and guitar is a set of easy arrangements of well-known Christmas Carols for clarinet and guitar. 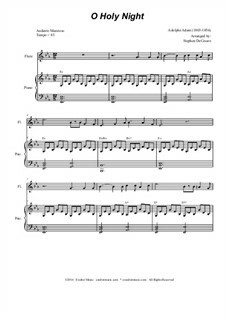 The pdf file contains the full score with fully notated guitar part, individual parts and also versions with the melody and chord names and with chord names and melody with chord names and fret symbols. This is an ongoing project, so please check for "Christmas Carols for clarinet and guitar" for new pieces over the coming few months. 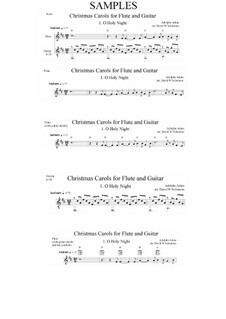 Christmas Carols for flute and guitar is a set of easy arrangements of well-known Christmas Carols for flute and guitar. names and with chord names and melody with chord names and fret symbols. 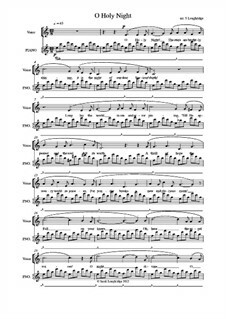 This is an ongoing project, so please check for "Christmas Carols for flute and guitar" for new pieces over the coming few months. It all started one holy night a long time ago the night of the dear Savior's birth. 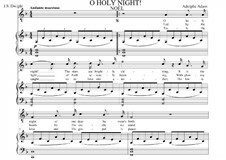 O Holy Night is written to peacefully and majestically celebrate the night of Christ's birth. 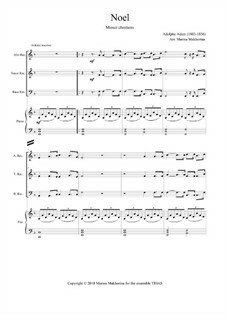 This piece is uniquely arranged for Treble F instrument with piano accompaniment. 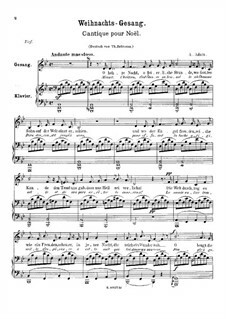 This is an easily floating christmas song, the wonderful melody has been composed by Adolphe Adam in 1847 to the French poem "Minuit, chrétiens". Have Fun! 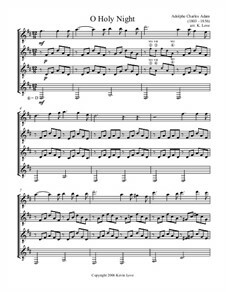 (French: Cantique de Noël) One of the most popular and beloved Christmas carols ever written has now been freshly arranged for Brass Quintet (Bb-Trumpet (2), French Horn, Trombone, Tuba), and Piano accompaniment. Accessible for all levels of playing and can be easily used in any church or concert setting. 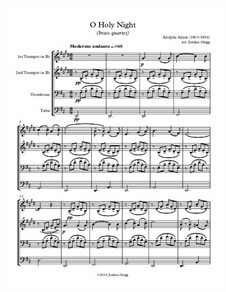 (French: Cantique de Noël) One of the most popular and beloved Christmas carols ever written has now been freshly arranged for Woodwind Quintet (Flute, Oboe, Bb-Clarinet, French Horn, Bassoon), and Piano accompaniment. Accessible for all levels of playing and can be easily used in any church or concert setting. 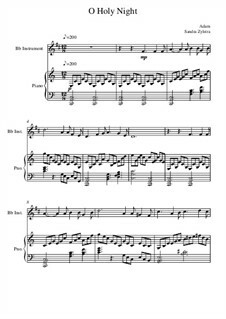 (French: Cantique de Noël) One of the most popular and beloved Christmas carols ever written has now been freshly arranged for Saxophone Quintet (Soprano Sax (2), Alto Sax, Tenor Sax, Baritone Sax), and Piano accompaniment. Accessible for all levels of playing and can be easily used in any church or concert setting. 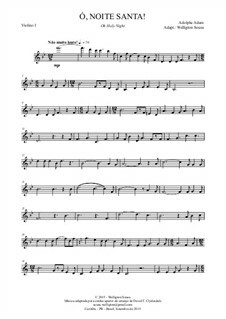 (French: Cantique de Noël) One of the most popular and beloved Christmas carols ever written has now been freshly arranged for Brass Quartet (Bb-Trumpet (2), French Horn, Trombone) with Piano accompaniment. Accessible for all levels of playing and can be easily used in any church or concert setting. 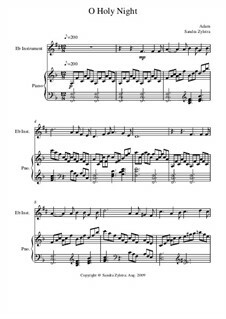 (French: Cantique de Noël) One of the most popular and beloved Christmas carols ever written has now been freshly arranged for Saxophone Quartet (Soprano Sax, Alto Sax, Tenor Sax, Baritone Sax) with Piano accompaniment. Accessible for all levels of playing and can be easily used in any church or concert setting. 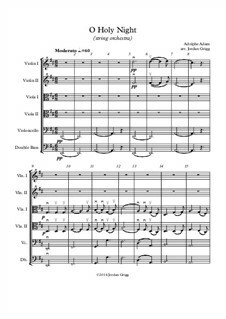 (French: Cantique de Noël) One of the most popular and beloved Christmas carols ever written has now been freshly arranged for String Quartet (Violin (2), Viola, Cello) with Piano accompaniment. Accessible for all levels of playing and can be easily used in any church or concert setting. 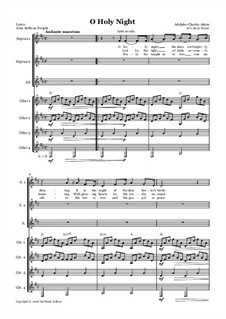 (French: Cantique de Noël) One of the most popular and beloved Christmas carols ever written has now been freshly arranged for Woodwind Quartet (Flute, Oboe, Bb-Clarinet, Bassoon) with Piano accompaniment. Accessible for all levels of playing and can be easily used in any church or concert setting. 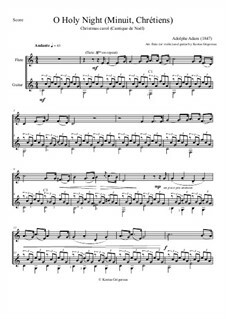 One of the most popular and beloved Christmas carols ever written has now been freshly arranged as a duet for Bb-Trumpet and French Horn with Piano accompaniment. Accessible for all levels of playing and can be easily used in any church or concert setting. One of the most popular and beloved Christmas carols ever written has now been freshly arranged as a duet for Soprano and Tenor Saxophone with Piano accompaniment. Accessible for all levels of playing and can be easily used in any church or concert setting. 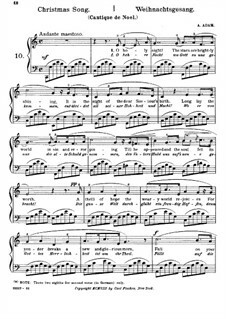 One of the most popular and beloved Christmas carols ever written has now been freshly arranged as a duet for Violin and Cello with Piano accompaniment. Accessible for all levels of playing and can be easily used in any church or concert setting. 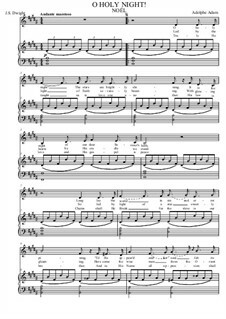 (French: Cantique de Noël) One of the most popular and beloved Christmas carols ever written has now been freshly arranged as a duet for Soprano and Alto Saxophone with Piano accompaniment. Accessible for all levels of playing and can be easily used in any church or concert setting. 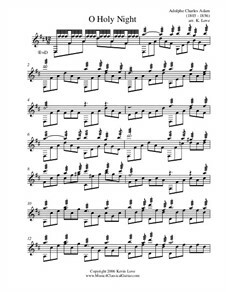 (French: Cantique de Noël) One of the most popular and beloved Christmas carols ever written has now been freshly arranged as a duet for Bb-Trumpet with Piano accompaniment. Accessible for all levels of playing and can be easily used in any church or concert setting. 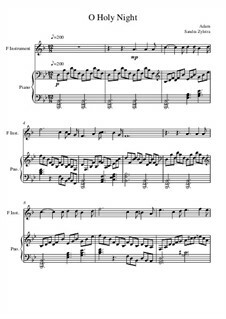 (French: Cantique de Noël) One of the most popular and beloved Christmas carols ever written has now been freshly arranged as a duet for Flute and Bb-Clarinet with Piano accompaniment. Accessible for all levels of playing and can be easily used in any church or concert setting. (French: Cantique de Noël) One of the most popular and beloved Christmas carols ever written has now been freshly arranged as a duet for C-Instruments with Piano accompaniment. Accessible for all levels of playing and can be easily used in any church or concert setting. 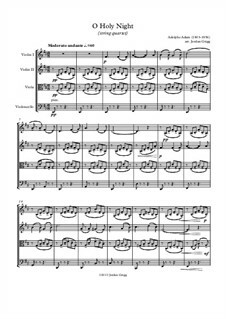 (French: Cantique de Noël) One of the most popular and beloved Christmas carols ever written has now been freshly arranged for a Solo Violin, String Quartet (Violin (2), Viola, Cello), and Piano accompaniment. Accessible for all levels of playing and can be easily used in any church or concert setting. 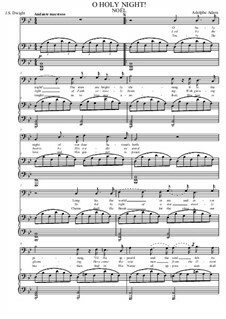 (French: Cantique de Noël) One of the most popular and beloved Christmas carols ever written has now been freshly arranged as a duet for Trombone, and Piano accompaniment. Accessible for all levels of playing and can be easily used in any church or concert setting. 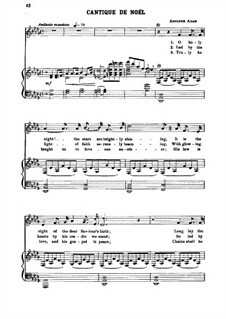 O Holy Night (A.Adam, J.S. 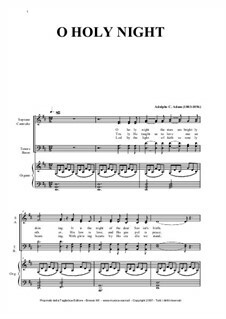 Dwight) for Contralto (G Major). English Modern Version. Tablet Edition, A5 (Landscape). 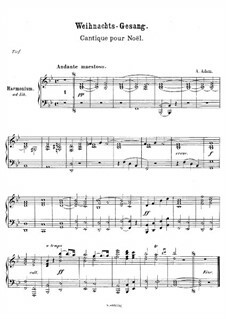 Digital Score. 5pp. With Piano Accompaniment Mp3 (backing track/Karaoke) by Xavier Palacios. 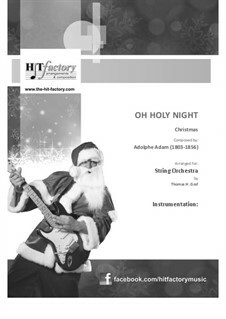 O Holy Night (A.Adam, J.S. Dwight) for Contralto (G Major). English Modern Version. Tablet Edition, A5 (Landscape). Digital Score. 5pp. With Piano Accompaniment with Vocal Melody Added (Mp3) by Xavier Palacios. O Holy Night (A.Adam, J.S. 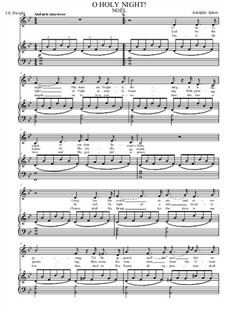 Dwight) for Contralto or Countertenor (F Major). English Modern Version. Tablet Edition, A5 (Landscape). Digital Score. 5pp. With Piano Accompaniment Mp3 (backing track/Karaoke) by Xavier Palacios. 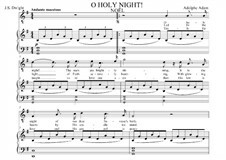 O Holy Night (A.Adam, J.S. 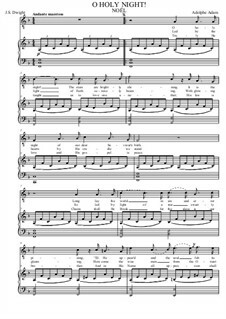 Dwight) Contralto or Countertenor (F Major). English Modern Version. Tablet Edition, A5 (Landscape). Digital Score. 5pp. With Piano Accompaniment with Vocal Melody Added (Mp3) by Xavier Palacios. O Holy Night (A.Adam, J.S. Dwight). English Modern Version. Tablet Edition, A5 (Landscape). 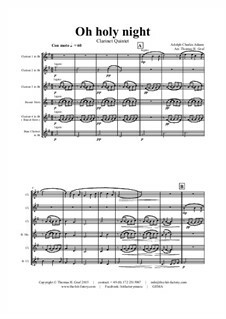 Digital Score. 5 pp. With Piano Accompaniment Mp3 (Backing track/Karaoke) by Xavier Palacios. 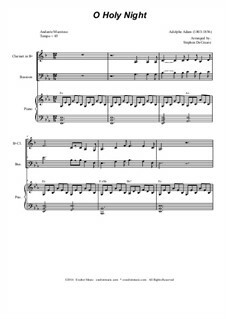 O Holy Night (A.Adam, J.S. Dwight) for Soprano or Tenor (D Major). English Modern Version. Tablet Edition, A5 (Landscape). Digital Score. 5 pp. 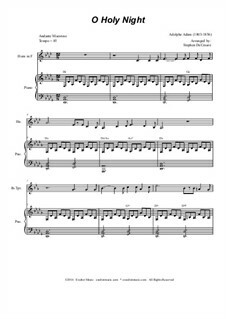 With Vocal Melody Added to the Piano Accompaniment (Mp3) by Xavier Palacios. O Holy Night (A.Adam, J.S. Dwight) for Soprano or Tenor (E-Flat Major). English Modern Version. Tablet Edition, A5 (Landscape). Digital Score. 5pp. With Piano Accompaniment Mp3 (backing track/Karaoke) by Xavier Palacios. 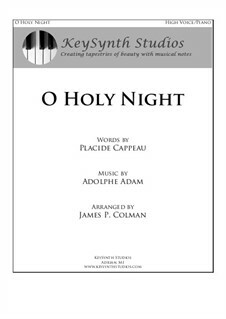 O Holy Night (A.Adam, J.S. Dwight) for Soprano or Tenor (E-Flat Major). English Modern Version. Tablet Edition, A5 (Landscape). Digital Score. 5pp. With Piano Accompaniment with Vocal Melody Added (Mp3) by Xavier Palacios. This is the classic christmas carol O Holy Night in Violin-violin Duet version with an alternative viola part special to play at Church, recitals, concerts and any Christmas event. 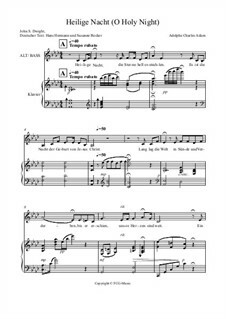 This version comes with new german lyrics and some beautiful piano figures so as rhythmic, metric and harmonic changes. 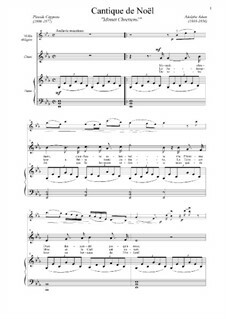 Singer and piano player obtain the fine dynamics. 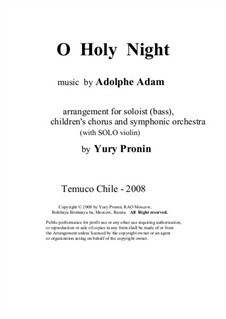 O Holy Night (A.Adam, J.S. 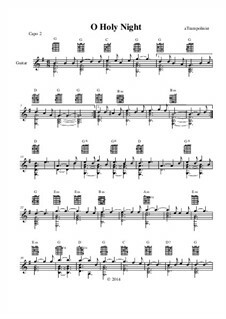 Dwight) for Bass (G Major). English Modern Version. Tablet Edition, A5 (Landscape). Digital Score. 5pp. With Piano Accompaniment Mp3 (backing track/Karaoke) by Xavier Palacios. 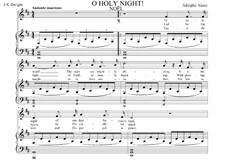 O Holy Night (A.Adam, J.S. 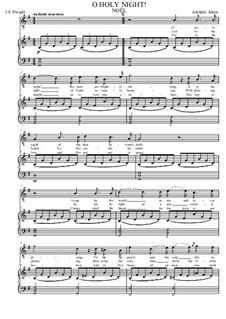 Dwight) for High Soprano or Tenor (E Major). English Modern Version. Tablet Edition, A5 (Landscape). Digital Score. 5pp. With Piano Accompaniment Mp3 (backing track/Karaoke) by Xavier Palacios. 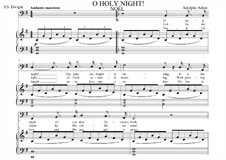 O Holy Night (A.Adam, J.S. Dwight) for High Soprano or Tenor (E Major). English Modern Version. Tablet Edition, A5 (Landscape). Digital Score. 5pp. 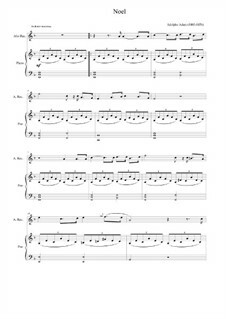 With Piano Accompaniment with Vocal Melody Added (Mp3) by Xavier Palacios. 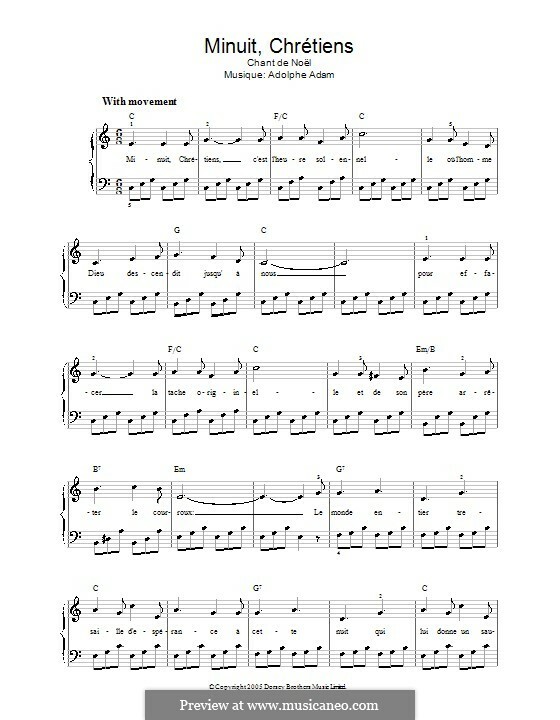 Weihnachtslied für ein Soloinstrument begleitet von einem Klavier. Mögliche Ausführung eines beliebigen Werkzeugs. Weihnachtslied für drei Instrumente, begleitet von einem Klavier. Anstelle von 3 Recorder kann durch eine Zusammensetzung von Instrumenten durchgeführt werden. I've played so many carols by now, but hardly any of them is closer to me than O Holy Night..
For organ solo Arrangiert von Boyse A.
Für Flöte und Gitarre Arrangiert von Grigoreas K.
For violin and guitar Arrangiert von Grigoreas K.
Für Chor und Orgel Arrangiert von Buck D.
For voice, piano and harmonium – solo part Arrangiert von Kücken F.W. For voice, piano and harmonium – harmonium part Arrangiert von Kücken F.W. For voice, piano and harmonium Arrangiert von Kücken F.W. 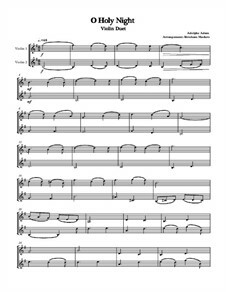 Für Gemischter Chor und Orgel Arrangiert von Tagliabue R.
For soloist, children's chorus and symphonic orchestra (with solo violin) Arrangiert von Pronin Y. For female choir and four guitars Arrangiert von Kvam R.
Für Sopran, gemischten Chor und Klavier Arrangiert von Loughridge S.
Für Gitarre Arrangiert von Love K.
For choir and guitars Arrangiert von Kvam R.
For orff ensemble Arrangiert von Johnson Y.
Für Klarinette und Gitarre Arrangiert von Solomons D.W.
Für Flöte und Gitarre Arrangiert von Solomons D.W. 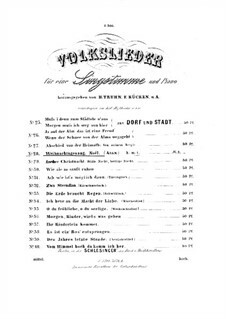 Score for two performers (in B Flat) Arrangiert von Zylstra S.
For soprano, piano and string orchestra Arrangiert von Struck P.
For wind quintet Arrangiert von Graf T.H. 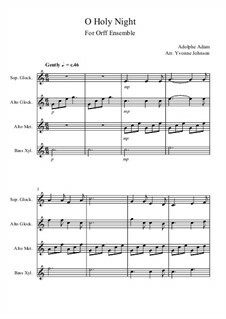 For clarinet quintet Arrangiert von Graf T.H. 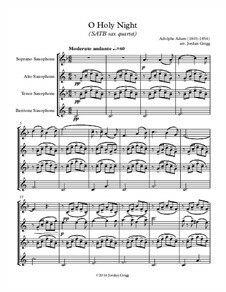 For saxophone quintet Arrangiert von Graf T.H. Für Blechblasquintett Arrangiert von DeCesare S.
Für Blechblasquintett Arrangiert von Graf T.H. Für Streichorchester Arrangiert von Graf T.H. 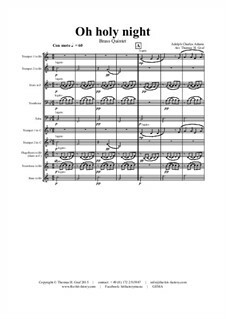 For woodwind quintet Arrangiert von DeCesare S.
For saxophone quintet Arrangiert von DeCesare S.
Für Blechblasquartett Arrangiert von Graf T.H. 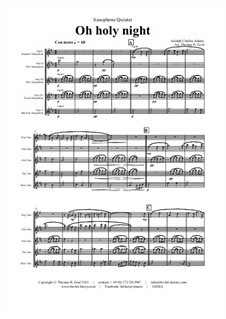 For clarinet quartet Arrangiert von Graf T.H. For saxophone quartet Arrangiert von Graf T.H. Für Streichquartett Arrangiert von Graf T.H. 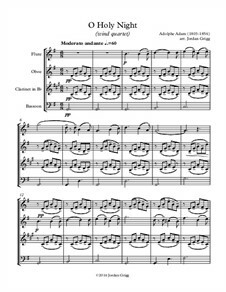 SATB sax quartet Arrangiert von Grigg J.
Für Blechblasquartett Arrangiert von DeCesare S.
For saxophone quartet Arrangiert von DeCesare S.
Für Streichquartett Arrangiert von DeCesare S.
For woodwind quartet Arrangiert von DeCesare S.
Duet for Bb-trumpet and french horn Arrangiert von DeCesare S.
Duet for soprano and tenor saxophone Arrangiert von DeCesare S.
Duet for violin and cello Arrangiert von DeCesare S.
Duet for soprano and alto saxophone Arrangiert von DeCesare S.
Duet for Bb-trumpet Arrangiert von DeCesare S.
Duet for flute and Bb-clarinet Arrangiert von DeCesare S.
Duet for C-instruments Arrangiert von DeCesare S.
For solo violin and string quartet Arrangiert von DeCesare S.
For trombone duet Arrangiert von DeCesare S.
Violin duet Arrangiert von Maduro A.
Für Stimme und Klavier Arrangiert von Becker H.H. 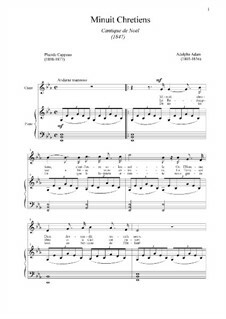 Partitur für zwei Interpreten Arrangiert von Makhorina M.
For quartet instruments Arrangiert von Makhorina M.
For two voices and piano Arrangiert von Colman J. 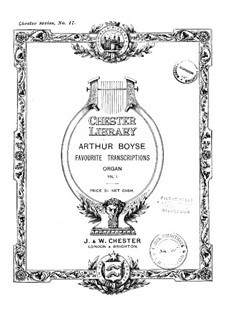 For baritone and piano Arrangiert von Colman J. 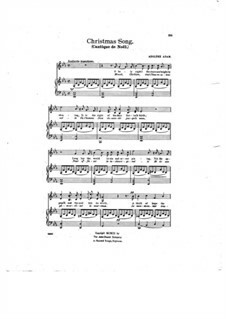 For bass and piano Arrangiert von Colman J. 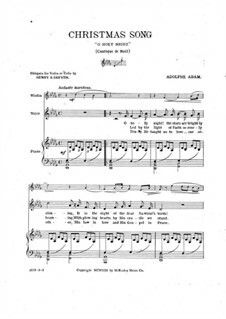 For soprano and piano Arrangiert von Colman J.